The gardens on this year's tour are listed in the three sections below by garden or host name. Click on any garden for a brief description and pictures. Register now to get the locations of the gardens. Check back for changes and additions. Click here for events happening during the tour. Click on the link below for a table showing all the gardens and which gardens have which features. In addition to the photos on each garden's page, more photos may be posted here. 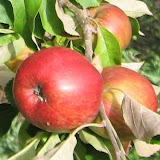 Click on the photo of Rebecca's apples to go to our photo album. Garden hosts can post photos from their gardens directly here, so come back later and see what's new.